MUMBAI: The Reserve Bank today decided to withdraw all currency notes issued prior to 2005, including Rs 500 and Rs 1,000 denominations, after March 31 in a move apparently aimed at curbing black money and fake currencies. Asking people not to panic and cooperate in the withdrawal process, the Reserve Bank of India (RBI) said old notes will continue to be legal and can be exchanged in any bank after April 1. 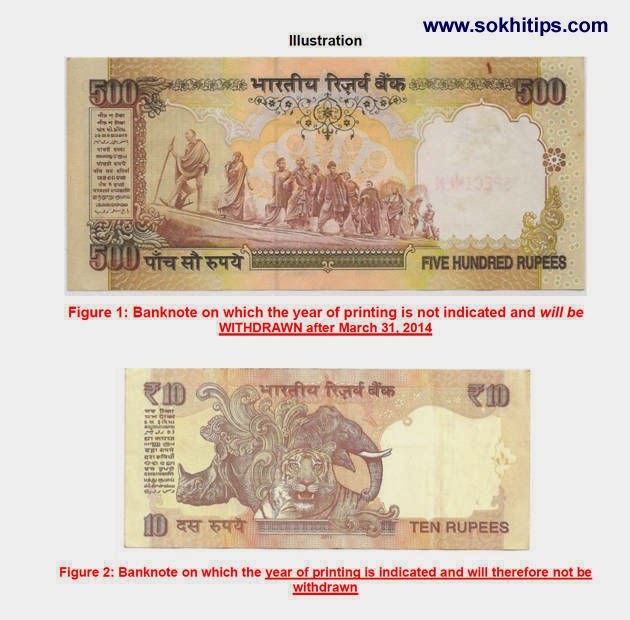 "From April 1, 2014, the public will be required to approach banks for exchanging these notes. Banks will provide exchange facility for these notes until further communication," the RBI said. From July 1, 2014, persons seeking exchange of more than 10 pieces of Rs 500 and Rs 1,000 notes will have to furnish proof of identity and residence to the bank. Although the RBI did not give any reason for withdrawal of pre-2005 currency notes, the move is expected to unearth black money held in cash. As the new currency notes have added security features, they would help in curbing the menace of fake currency. At present, currency notes in denominations of Rs 5, Rs 10, Rs 20, Rs 50, Rs 100, Rs 500 and Rs 1,000 are issued. The central bank had earlier discontinued printing of Rs 5 note, but reintroduced this denomination later to meet demand. Earlier, the RBI had withdrawn a certain series of currency notes at bank level but bearers were not asked to get them replaced.